I don’t use facebook much, but when I do, I get super lucky. 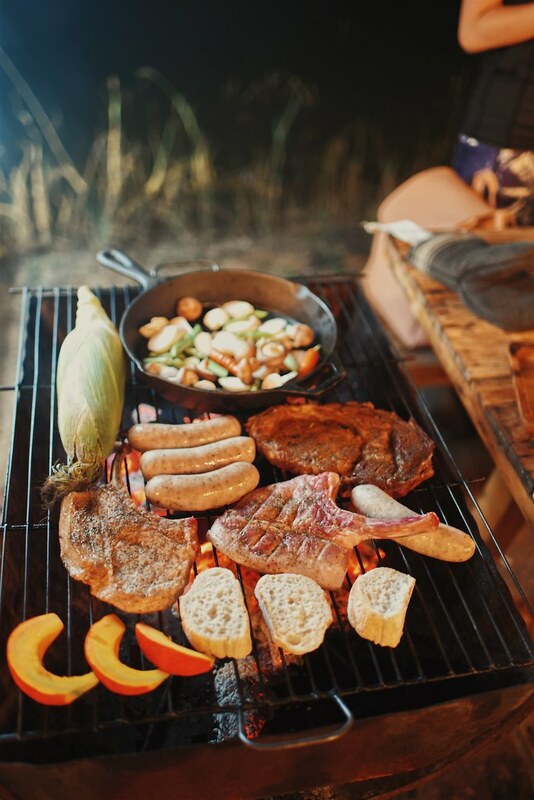 Camp Meating popped up on my facebook feed a couple of weeks ago, one of those re-shared photo albums with an attached comment from an acquaintence, something along the lines of, omg, goals, ded, etcetera. Normally, I would have browsed and forgotten all about it, but as it happens I had just gotten booked for a travel campaign in Chiang Mai with Klook and Tourism Authority of Thailand. 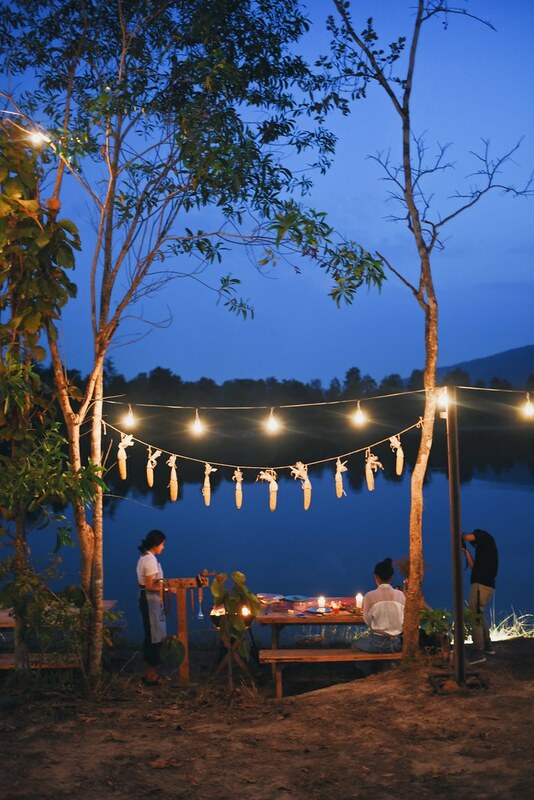 I cross-checked it against my itinerary and realised we had no scheduled dinner plans, so a hop and a call later, we found ourselves booked in at Camp Meating for our last dinner in Chiang Mai! 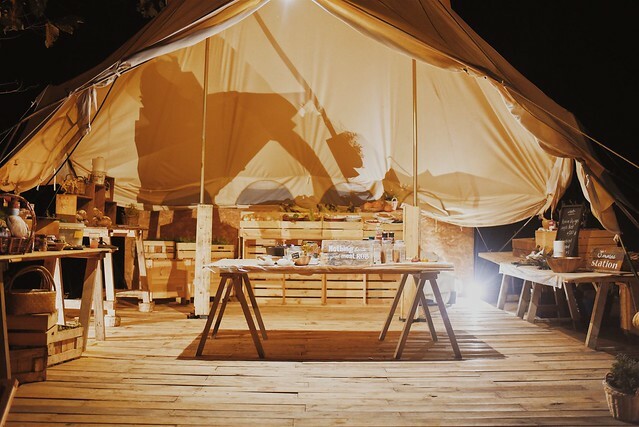 Despite the name, Camp Meating isn’t actually a glamping location nor an accomodation option. 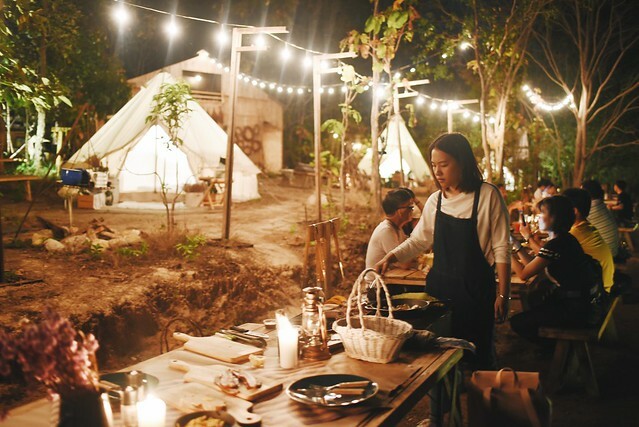 It’s a weekend outdoor dining experience styled like a glamping site, which is why the entire place looks so dreamy. When I ran a search on it online, many reviews mentioned that it was a hidden gem, but I didn’t realise they meant it quite so literally. As it was, getting there was an ordeal. 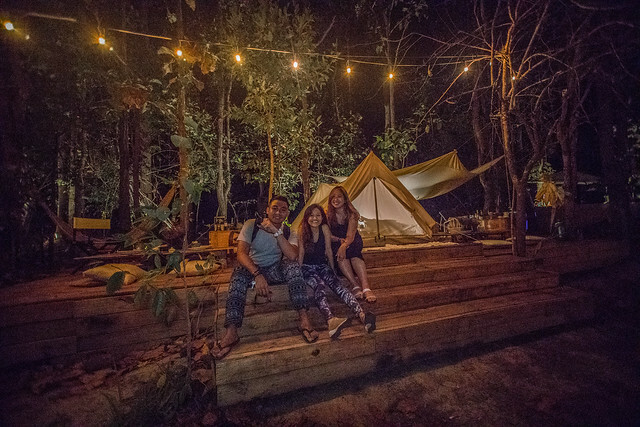 Located half an hour by car from Chiang Mai city in the Mae Rim district, I 100% suggest you get a taxi or uber, or if you have a car, drive. I cant even begin to imagine what it would have been like if we’d tried to tackle it by public transport. We booked an uber that flat out refused to take us (are they allowed to do that?!) because it was too far, and then we got another uber which struggled to find the location. On Google Maps it actually pins the place as Unnamed Road, which as you can imagine, is pretty worrying. It’s buried deep in the recesses of what looks like a miliary camp, and driving in, you’re constantly like, is this correct?? Well, it is. And when we tried to get an uber home afterwards, the driver asked us to give her an extra tip because the drive in was so scary and dark (we gave her 150Baht extra). So yeah, it’s not easy to get it. But I think the isolation of the place is half of what makes it so incredible once you do get there. Aside: We paid about 170BHT to get there by uber, and gave an extra 40BHT as a tip. Then the ride back was 180BHT, with an additional 150BHT tip. INSANE. IN-SANE! I heard a gasp then realised it came from me. Before I could start to feel embarassed I realised my companions all had their mouths open too. It was just so damned magical, it was like it emerged from the pages of a storybook. Lights everywhere, lakeside tables, and the smell of barbeque, all to the background soundtrack of American swing music. Someone designed this experience and designed it well. We had reached just as the sun was about to set, because of our filming schedule for the day as well as the delays in getting a ride there. So we’d missed golden hour, but we caught the last vestiges of dusk. It was so, so beautiful. 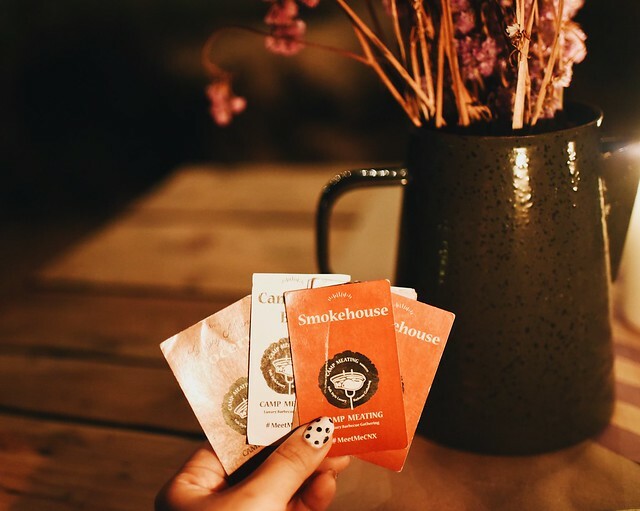 As we made our way to our table, we were handed vouchers for the different food stations, and then left to take pictures and explore before starting our dinner. After we’d finished a round of exploring the campsite, the server magically reappeared and started explaining how the dinner worked. Each table came with its own cook, like a personal chef. 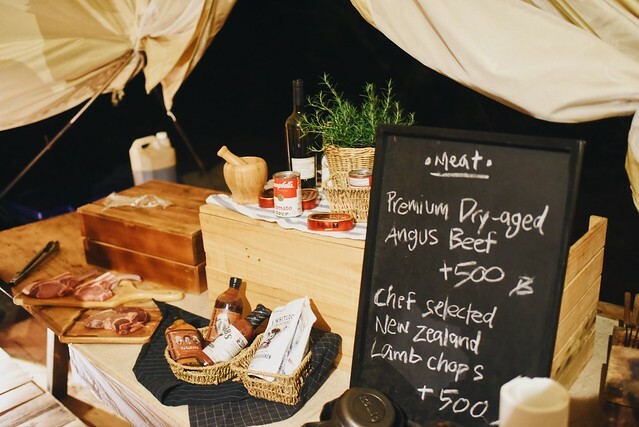 You could go to three different stations to get your food: the main tent for your main dish and sides, a bar counter, and the smokehouse, for sausages and bacon. The sides and smokehouse were unlimited, and dinner came with a standard chunk of pork and a welcome drink (punch or water), with the option to upgrade to beef or lamb for 500BHT more. Snippets from the main station, located in a giant tent! The set up is super cute. 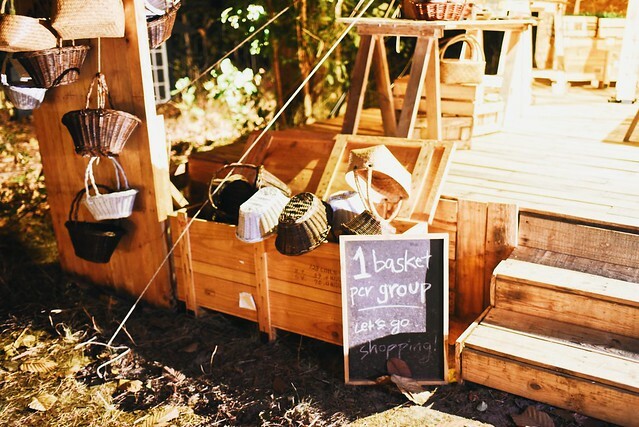 At the main tent, you get a little basket which you can fill with sides – sliced bread, chips, different kinds of veggies like asparagus, capsicum, corn, mushrooms, cherry tomatoes, and baked potatoes. You can also collect your main meat there – Mabel and I stuck to the original pork option, and Lock upgraded his to a beef steak. 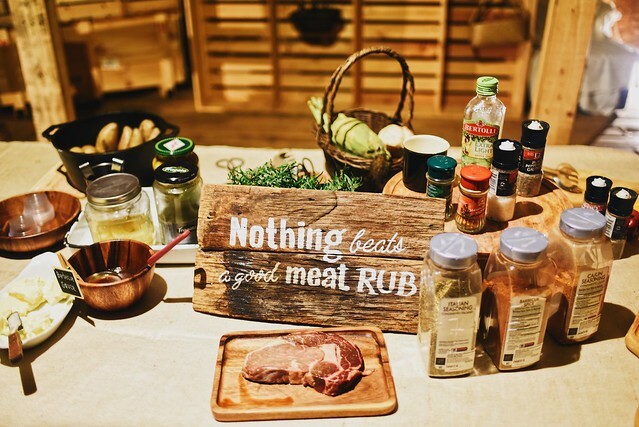 Then you season your food the way you like it – there’s a table with a bunch of herbs and spices you can use, and if you dont know what to do, the staff are on hand to help you. 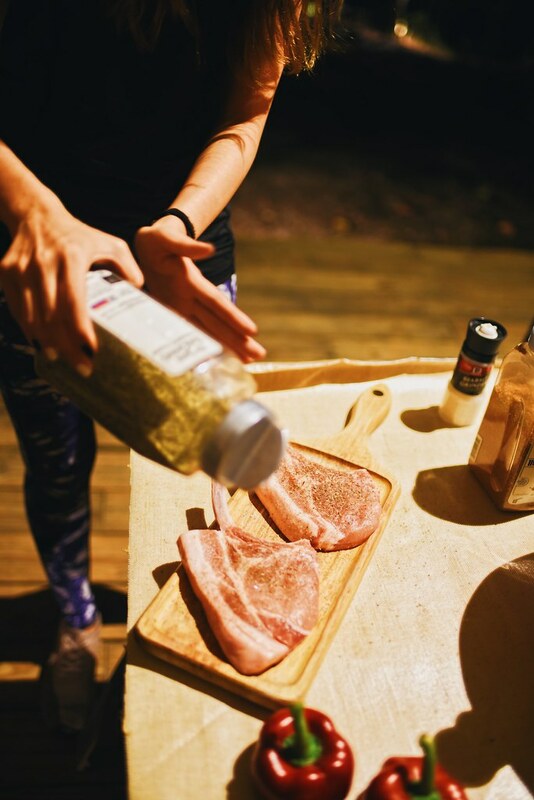 Then you hand it to the staff and they take it to your table to barbeque for you! The drink station lets you have water or punch for free as a welcome drink, and you pay extra for anything else you want. Soft drinks are an additional 40BHT, and I got a hoegarden, which was 160BHT. Super pricey for thai standards, especially since in the city center you can get a beer easily for 50BHT. But, yknw, it’s still cheaper than Singapore so I still went for it anyway. Drink station, but the punch was nearly all gone by the time we got there cos we were so late! And the smokehouse station is literally a little smokehouse where sausages and thick cut bacon strips are slowly being smoked. When you go to this station, they fill a little wooden tray of sausages and bacon for you, and you can head back to your table and have it while waiting for the rest of your food to cook. 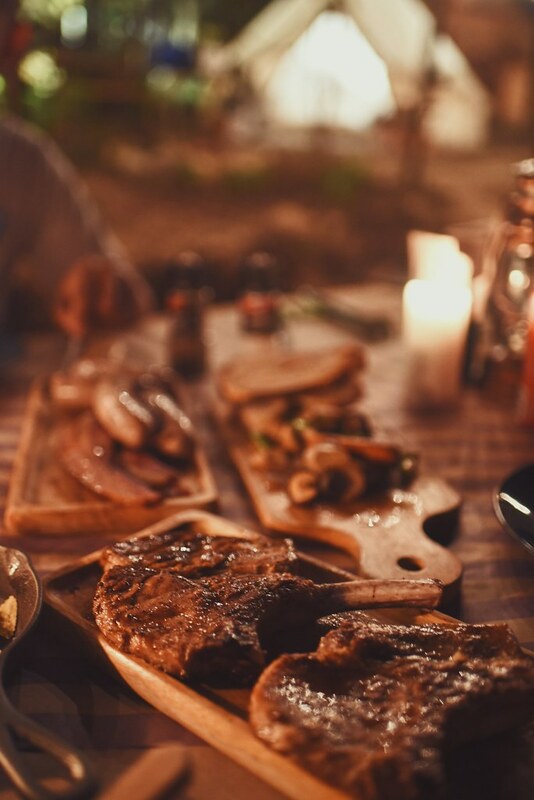 Your table’s personal chef starts cooking once you’re ready, and everything goes in – ours chopped and roasted our veggies, did our steaks of meat perfectly, and even buttered and toasted our bread slices for us! After she’s done she kind of just goes back to chill at one of the stations, so I assume if you need more help you can either ask her again or do it yourself. We were super stuffed just from whatever we had though, so we didnt go for round two, I cant imagine how hungry you have to be to get a sausage and bacon refill because it’s just so much food. But the option is there, I guess. The pork was a really good cut, very tender and juicy, and the beef (I tried a mouth from Lock) was really delicious too. And the portion was pretty generous – each slab of meat wasn’t just big, it was thick. Same goes for the bacon – it’s like British bacon where each slice is thick and meaty, not like the American variation where it’s all crispy and crackly. Anyway, the point is, there was a lot of food, and it was all delicious. delicious. one of the rare times i enjoyed pork more than beef, even. We were left to have our dinner in peace, then as we were finishing up, the chef returned with a pan of s’mores that we could DIY roast over the barbequeue. 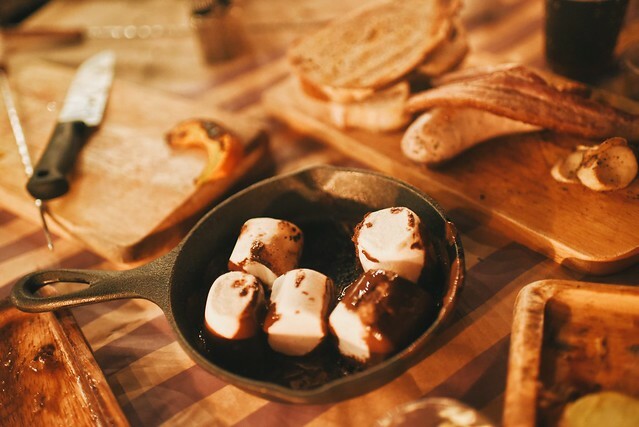 I havent had s’mores for so long – and they were really the perfect way to end the meal, especially fitting since the entire place was decorated like a campsite. The dinner cost us 1,200BHT per person (without upgrades), which is about 50SGD, and I think it’s so, so worth the money. Everything about the night was perfect. 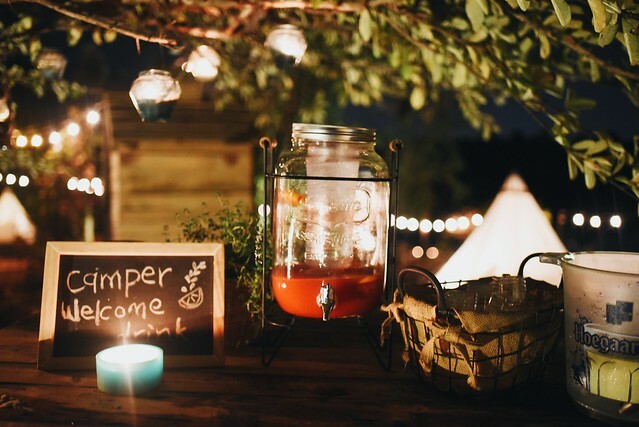 The only thing I would do differently if I have the chance to come back is to arrive earlier – the campsite opens from 5-930pm, and I can only imagine how beautiful it would be during golden hour! Apparently sometimes they also have the option for you to try canoeing and horseback riding before dinner, though that option wasnt available the day I was there. Hands down the best meal we had in Chiang Mai. 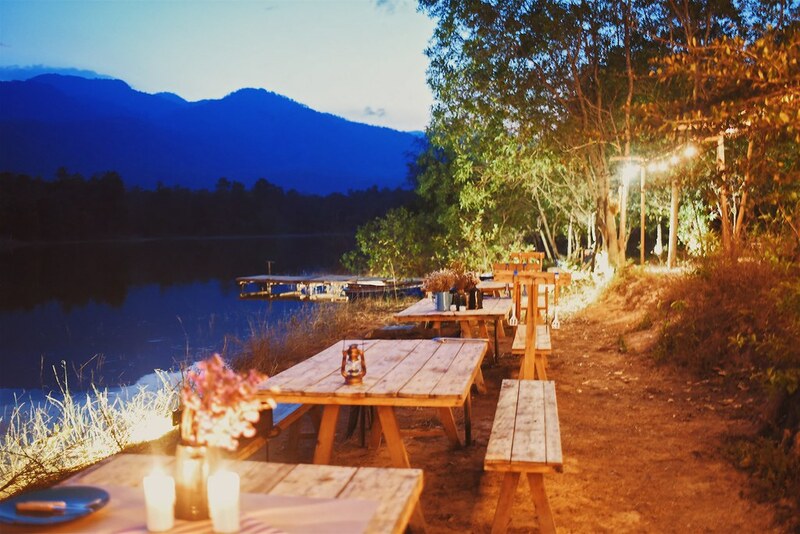 It wasnt just that the food was good, it was also the whole experience – the setting, the music, the atmosphere. 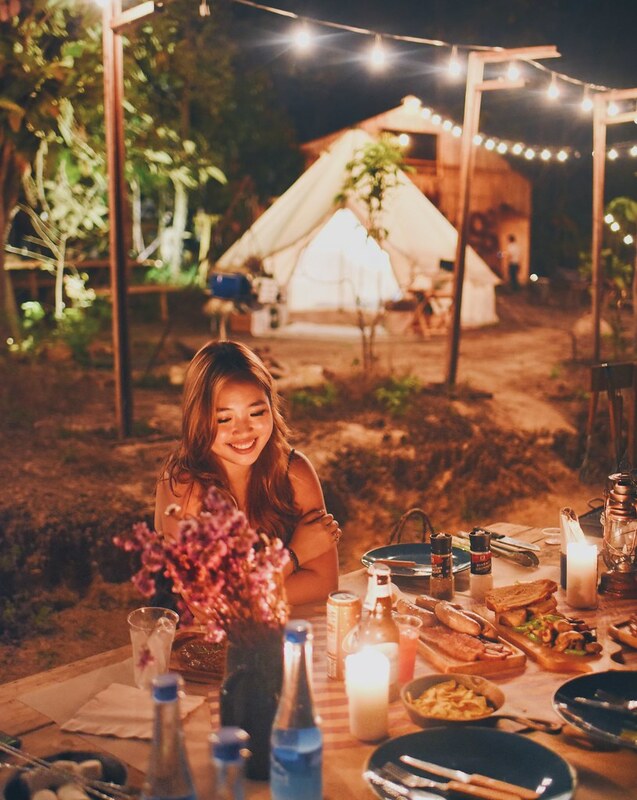 Despite the climate in Southeast Asia it wasn’t humid at all, and we didn’t break a sweat sitting there all night even though we’d mentally prepared for the outdoor dinner to be a sweaty affair. That’s thanks to the lake, I think. I recommend this so, so hard. Reservations required – I did it by phone 2 days in advance.